Do you want to unlock pattern lock of Oppo F1s A1601 android phone? If yes, then you have landed on right place. Here is a quick detail post to learn “how to unlock Oppo F1s A1601 without losing data? Yes, if you forget the pattern lock or Pin lock and device is asking to enter correct PIN or you are unable to perform factory reset from recovery mode then this tutorial can be very helpful for you. Just download free Miracle 2.58 as Oppo F1s pattern unlock tool and follow the steps as shown below. No need to purchase any premium Tool like UMT dongle to unlock Oppo F1s mobile. Free miracle 2.58 without box can do it for you easily. Basically Oppo F1s A1601 is a mediate [MTK] chipset based android phone, so we can read pattern lock of Oppo F1s by Miracle 2.58 tool. Unable to factory reset Oppo F1s then use this method. No need to buy any premium tool to unlock Oppo F1s marshmallow mobile. Unlock Oppo f1s without flashing firmware. Oppo f1s pattern lock file not required. Unlock Oppo f1s FRP Lock. If you are going to use UMT tool to unlock Oppo F1s then we are not sure about data will erase or not. 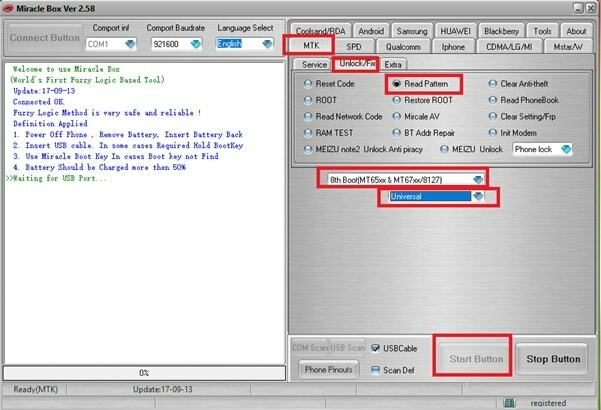 But, using Miracle 2.58 you can read pattern lock of the device without losing personal data and phone data. Any noob or advance user can try this method to unlock their own Oppo f1s A1601 marshmallow mobile. Let’s start the process and read pattern lock of MTK chipset based Oppo F1s mobile phone. Disable anti-virus and extract the downloaded Miracle 2.58 on desktop. Otherwise it will delete the exe setup file. Now launch the Miracle 2.58 as administrator. Again set the below section on “Universal” optional. Finally hit on “START” button. Ok now come to device and power of it properly. This step is very important. Press & Hold Volume up key + power key + attach USB cable at the same time. If everything is ok, tool will detect the device automatically, otherwise press boot key again. 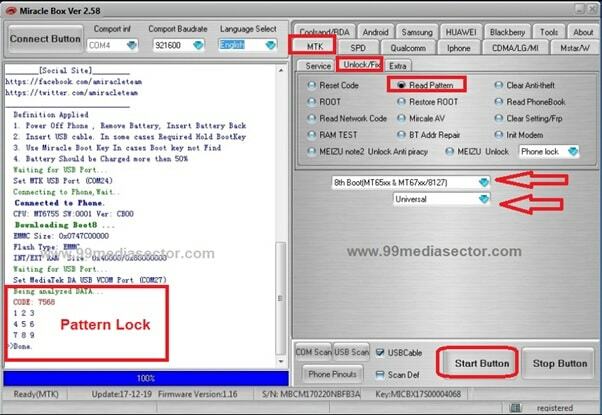 Once the tool detect your locked oppo f1s, pattern lock reading process will start and just in few minutes, it will show the pattern lock as a numeric number. Q1 Is root required to read password on Oppo F1s mobile? Ans. No, root not required. Method works on both rooted and non-rooted device perfectly. Q2 USB debugging should be on oppo F1s to unlock using miracle box. Ans. Read pattern lock with or without enable USB debugging. Q3 this method will delete phone data or not? Ans. No, read oppo f1s password without data lose. It’s all about how to unlock Oppo F1s without losing data? Simply use the free Miracle 2.58 and read pattern lock of Oppo f1s mobile. Till now getting any issue to unlock Oppo F1s A1601, please notify us by leaving your comment.